With a little modern pizzazz thrown into these classic black work shoes, these Timberland Women’s TB0A1GW3 001 Black Powertrain Waterproof ESD Athletic Work Shoes look as great as they feel. You don’t have to leave your style behind when you head in for your ne ... (see full details) (see specifications) #TB0A1GW3001. With a little modern pizzazz thrown into these classic black work shoes, these Timberland Women’s TB0A1GW3 001 Black Powertrain Waterproof ESD Athletic Work Shoes look as great as they feel. You don’t have to leave your style behind when you head in for your next shift, since the fun and durable design is both subtle and eye-catching, adding some fun to your women's footwear. 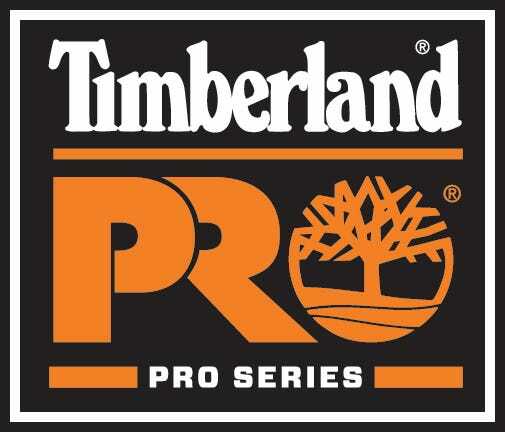 But more than that, these are from the Timberland PRO line of women's work shoes, easily one of the best-selling lines that's also known for comfort. The combination of lightweight comfort and cushioning Timberland has packed into durable work boots for their PRO Series is a winner in our book. You can enjoy these breathable, lightweight, waterproof ESD shoes just about anywhere, as they’re made job site tough and made for mileage. There are so many reasons to love these soft toe work shoes! The Ripstop nylon uppers are light and breathable (yet tough enough for working hard) with TPU overlays placed strategically over vulnerable areas of the Timberland Pro shoes for better durability. The Ghillie lacing systems offer the best fit possible, making these women's shoes feel more like athletic shoes, with the low cut and low profile of athletic footwear for better ankle motion. Lined with breathable mesh to promote air flow around your feet and breathable waterproof membranes, these ladies’ shoes keep your feet dry inside and out. Single-density open-cell polyurethane footbeds cushion your feet and provide constant static-dissipative performance in these ESD shoes. Fiberglass shanks offer lightweight and flexible stability to your every step as well. Dual-density polyurethane outsoles were added to the design of these athletic women's shoes with oil-resistant (per SATRA TM63), heat-resistant (up to 248-degrees Fahrenheit), and abrasion-resistant outsoles designed to survive industrial work environments. They also qualify for the CSA Omega Rectangle for meeting CSA (Canadian Standards Association) requirements for resistance to electrical shock in the outsoles. If you do a lot of walking and standing, particularly when you’re on hard surfaces like concrete or tile all day, your feet can really take a beating. That's because your feet experience stress with every step you take. When you feet contact the ground, the shock waves you feel slow wear on your feet. But with Timberland PRO’s 24/7 Comfort Suspension Technology, your feet will experience less shock, more cushion, and targeted support in key areas all designed to add a spring to your step and stamina to your day. The unique Anti-Fatigue Technology uses molded, inverted cones that support and collapse as needed to absorb the shock so your feet don’t have to. Adding extra support in the arch and heel of the waterproof athletic shoes, you'll feel the difference Timberland Pro can make in your day - from the very first day. Treated with anti-microbial treatment, these ladies’ black Powertrain shoes also prevent the growth of odor-causing microbes. So add a little modern style to your classic black shoes and head to work in these Timberland Pro Women’s TB0A1GW3 001 Black Powertrain ESD Athletic Waterproof Shoes from Working Person's Store. You'll love the way they look just as much as you love the way they feel. Timberland PRO Shoes: Women's TB0A1GW3 001 Waterproof Black ESD Athletic Powertrain Work Shoes is being added to your cart.